3 Reasons to Try Baaz | Nerd Much? Well, fellow nerds, we’re here to break things down for you. Here are three reasons you should give Baaz a try. If you want to read more about what Baaz is, you can do so here. If you’re like us, your morning routine consists of checking in on all of your social media. First, we’ll open the Facebook app and see what’s happening with our family and friends. Then, we’ll crack open our Twitter app of choice and check out our timeline. Then, we’ll open up the YouTube app to see if any of the 100s of channels we subscribe to have any new videos worth watching. Then, every once in awhile when I get the urge, I’ll check out Tumblr. With Baaz, however, you can get all of your other timelines from your other social networks in one app. The Baaz app allows you to add up to 150 different social networks (including those four I mentioned above) so that switching between each of their feed is as simple as tapping within the app. I can switch from Twitter to Facebook to Baaz, itself, in an instant. No more having to have all of the other apps on your phone, even; Baaz pulls everything together so you don’t have to fumble through each app during your morning routine. On many other social networks, trending news is an afterthought and you’re only given a subset of a handful of trending terms. 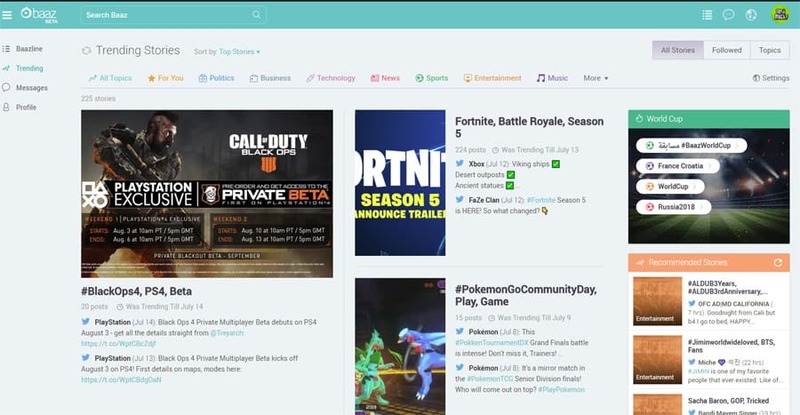 With Baaz, you can find trending stories easily by topic. Want to know what’s trending in the entertainment industry? It’s a click away. Want to know what’s the latest in gaming? You can easily see what’s trending with Baaz’s Trending Stories. With Baaz, you can find stories trending on other platforms and share it on any of the other platforms you’d like right from the app. From a business standpoint, it makes it easier for us to engage with our audience on all of our platforms at once, instead of having to go to each individual social network, find a story, then share it there. Each story in the Baaz app (or on the site) has a share button that allows you to not only quickly share the story on Baaz or copy the link, but also share that story directly to other networks with a single click. So we’ve given you three solid reasons to give Baaz a try, now the only thing left to do is go sign-up and follow your favorite nerdy site.